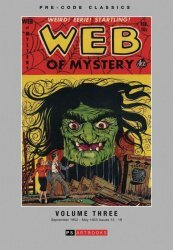 This fourth volume features Ace Comics issues of Web of Mystery 19 - 24 from July 1953 to May 1954. All are digitally enhanced and faithfully reproduced. Come put your little clawed and emaciated hand in ours -- we'll look after you. Ignore the darkness and the cemetery mist creeping through the Graveyard Gates, and ignore the fact that the flesh seems to have slipped from your face. No matter, for this is comic books the way they were and should always be. Artists include Warren Kremer, Mike Sekowsky, Martin Rose, Ken Rice,	Al Bellman, George Appel, Jay Scott Pike, Jim McLaughlin and Jerry Grandenetti. 216 Pages Full Color Hardback Book. Limited 300 Copies Worldwide. Release Date: November 2018. 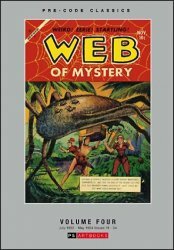 Important Shipping Information: This book qualifies for economy Media Mail shipping as long as all other items in the shopping cart, if any, also qualify (books, DVDs, VHS only). If other types of items are in the cart, you must choose a different shipping method or do a separate order. Missed Volume 3? Use the convenient Buy Both button below!